English, Sterling Silver, 2 Handled Sandwich or Bar Tray. Hallmarked On Rear. Made By Horace Woodward & Co, Dated 1946. The Tray Is Centered With A Beautiful Hand Engraved Crest & Latin Motto That Translates As “Aim At A Sure Thing”. 17 3/4″ x 5 3/4″. Antique English, Victorian, Sterling Silver Footed Tray. Oval, two handled, sterling silver, Georgian style tray with applied reeded border and cast handles to match. Made By L A Crichton, London, 1919. Hallmarked on underside. The tray measures 28″ x 17.50″. The usable surface area of the tray is 21″ x 15″. Large, 2 handled, sterling silver Chinese export tray, Made By L.Y.H. Measures: 59cm x 38.5cm. Large Oval, 2 Handled, Sterling Silver Gallery Tray. Tiffany Portugal. 20″ x 14″ x 2 1/8 High. Sterling silver, footed, hand-wrought tray. Measures: 10″ square x 1 1/8″ high. Sterling silver, Art Nouveau style, large round tray. Made By Redlich & Co For Spaulding & Co Of Chicago. The floral, three dimensional border is crisp and beautifully detailed. Measures: 16.25″ diameter. English, sterling silver two handled tray. Made in London by Frank & Samuel Fenton in 1886. Cast handles, applied heavy bead border and beautiful hand engraved decoration, centered by a blank cartouche. Tray measures: 29.5″ x 18.75″. English, Sterling Silver Salver / Round Tray Having A Round Shaped Form With Applied Bead/Pearl Border, Standing On 4 Cast Claw & Ball Feet. Made By Barker Brothers. Hallmarked 1949. An Exceptional, Unusual, Decorative And Usable Cast Border, Sterling Silver Tray. The Border & Handles Are Cast With Grape & Vine Decoration. In Amongst The Vine Are A Variety Of Detailed Insects, Snails Etc. The Handles Have The Bacchus Mask. The Center Of The Tray Has A Beautifully Hand Engraved Dove With Olive Branch Armorial. An Amazing Piece Of Silver… A Work Of Art. Tray Is Fully & Correctly Hallmarked. Weighs 4,986 Grams = 160 Troy Oz. A Very Large, Sterling Silver Art Nouveau Style 2 Handled Tray. Made By The Goldsmiths & Silversmiths Co. Of Regent Street, London, Jewelers To The Queen. Fully & Hallmarked For London 1929. The Tray With Hand Engraved Decoration, Cast Handles And Centered With A Beautiful Hand Engraved 3 Letter Monogram. The Rear Of The Tray Has A Later Inscription As Follows: “To Tania On Her 21st Birthday. With Love From Jimmy. 8th January 1934”. What A Great 21st Birthday Present. Tray Measures 28.25″ x 21.25″ From Border To Border, And 35.5″ Including The Handles. Rare To Find Such A Large Sterling Tray, Especially Of This Quality, And By An Excellent Silversmith. Superb Quality Antique French Sterling Silver Tray, By Maison Odiot, Paris. The Work And Style Of This Tray Are Very Unique To Parisian Silversmiths, Even Down To The Hand Engraved Monogram In The Center Cartouche And The Heavy Quality Applied Border & Handles. The Standard Of Silver Is 950 Standard Which Is Actually Higher Quality Than Sterling, Which Is 925, And Again Is Typical Of Parisian Silversmiths. This Really Is An Exceptional Tray, Usable And Very Decorative. Tray measures 32.5″ x 22.25″. Weight 4,850 Grams. 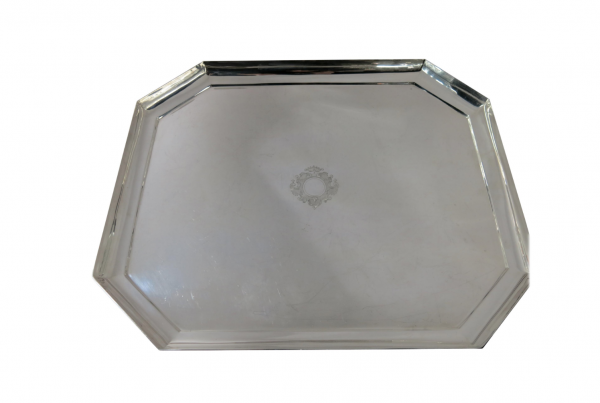 An Exceptional Quality & Condition, Martin & Hall Octagonal Sterling Silver Gallery Tray, With Cast Handles & Feet. The Surface Of This Tray Is Beautifully Hand Engraved, And The Gallery Rim Hand Engraved & Pierced. Standing On 8 Cast Feet. This Is One Of The Best Styles Of Gallery Tray One Can Find, The Quality Is Superb. Made By Martin & Hall, One Of The Premier Victorian Silversmiths. Fully & Correctly Hallmarked. Dated 1878. 27.5″ x 18.25″ x 4.25″ High. Oval, 2 Handled, Sterling Silver Tray With Bright Cut Hand Engraved Decoration. Made By Elkington & Co. One Of The Premier Silversmiths Of The 19th Century. Hallmarked 1866. 30.50″ x 20.50″. Superb quality, 2 handled, antique Victorian tray. Beautiful hand engraved decoration, applied border, cast handles & 4 cast shell feet. Measures 30.25″ x 19.5″ x 3.75″ high. Weighing in at over 5.70 kilo. Made in London by Rebecca Emes & John Barnard, one of the premier English silversmithing firms, and possibly one of the oldest silversmithing firms in the world. The origin of this business having been established by Anthony Nelme c. 1680. Francis Nelme inherited the business on the death of his father in 1722 and continued until 1739 when Thomas Whipham took over the business. On his death in 1756 his son Thomas Whipham jr took into partnership Charles Wright. Thomas retired in 1775 and the business was continued by Charles Wright. The business was amalgamated by Henry Chawner in 1786 and the latter son of Edward Barnard (I) became the foreman of the firm. Chawner was master to the first Edward Barnard (I) so that the connection of the Barnard family can be traced from 1773. In 1796 took into partnership John Emes that became the owner after the retirement of Chawner, maintaining Edward Barnard (I) as manager. Emes died in 1808 and his widow Rebecca took as partner Edward Barnard (I). Rebecca Emes withdrew in 1829 and Edward Barnard (I) became the proprietor with his son Edward Barnard (II), John Barnard and William Barnard, trading under the style Edward Barnard & Sons. After the retirement of Edward Barnard (I) the firm was continued by Edward Barnard (II) (1846-1851), John Barnard (I) (1846-1868), William Barnard (1846), Edward Barnard (III) (1868), Walter Barnard (1868-1903), John Barnard (II) (1868-1903), Michael Barnard (1896-1903), Stanley Barnard (1896-1903) and Robert Dubcock (1896). The firm was converted into a limited liability company in 1910 under the style Edward Barnard & Sons Ltd. In 1977 Edward Barnard & Sons Limited became a subsidiary of Padgett & Braham Ltd.
English, Sterling Silver Square Footed Tray / Salver. Made By Peter Guille, London 1948. Unusual To Be Of The Higher Standard 950 Hallmark, As Opposed To The Standard 925 Hallmark. Ideal For Serving Drinks, Hors D’Oeuvres etc. Excellent For Presentation Award etc. Just One Of A Huge Selection Of Sterling Silver Trays In A Variety Of Sizes, Prices, Periods. Antique English, Round Footed Salver / Tray With Gadroon Border. Standing On 4 Claw & Ball Feet. Sterling Silver, Made By Thomas Bradbury & Sons, London 1917. Ideal For Card Tray, Drinks, Hors D’oeuvres And Also For Presentation. This is just one from a selection of at least 20 small sterling trays we currently have in our huge inventory. Square, round & oval. Sterling Silver, Hallmarked, Large Round Footed Salver / Tray. Made In Edinburgh By The famous Scottish Silversmith Hamilton & Inches, Dated 1926. 18″ Diamter. Sterling Silver, English Hallmarked, Large Round Footed Salver / Tray. 14″ Diameter. Hallmark 1959. 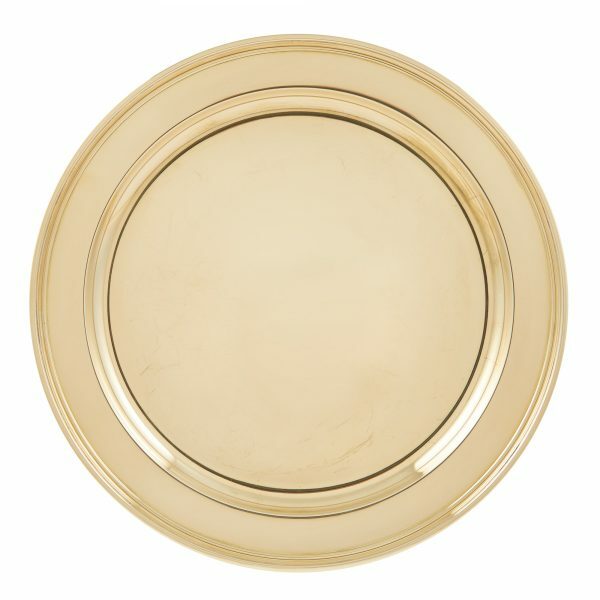 Made By Robert Pringle & Sons Great As A Drinks Tray, Hoers D’oeuvres Or For Presentation / Trophy. Antique Victorian, Sterling Silver Tray. Victorian Sterling Silver, Footed, 2 Handled Tray Made By Edward & John Barnard, London 1853. The Oval Shaped Tray Standing On 4 Cast Feet, With 2 Cast Handles , Heavy Applied Border And Beautiful Hand Engraved Surface. Typical Of The Victorian Style. 28 1/4″ x 20″ x 2 1/2″ High. Fully & Correctly Hallmarked The Barnard Family, Probably One Of The Oldest Silversmithing Companies In The World, Tracing Back To Anthony Nelme Circa 1680, All The Way Until The Late 20th Century.